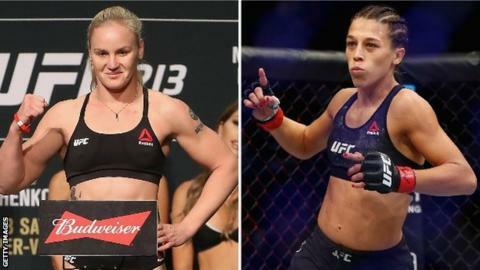 Valentina Shevchenko has already beaten Joanna Jedrzejczyk three times, but says the pair "are not enemies" as they prepare to meet for the vacant flyweight title at UFC 231 in Canada. Saturday's bout in Toronto comes a decade after Shevchenko took the last of those wins in the Muay Thai arena. "I'm feeling very good, very strong," Shevchenko told BBC Sport. "I believe in my strengths - in my power, my speed and technique. We were training very hard and everything that I have I will show on Saturday night." "We have our history in Muay Thai, we fought three times and now this Saturday we will start our history under MMA rules," said Shevchenko. "Every experience brings something, from one point it is good because you know what to expect from this kind of opponent - what is her speed, her striking force. "It helps, of course - every single fight brings you more confidence and you gain more experience." "In UFC we were competing in different weight classes," added Shevechenko. "We had nothing to share between us, we had a good relationship. "When we were in Muay Thai competitions we were never enemies, but we had our rivalry of pure sportsmanship. "In the fight we are fighters, but after we have respect for each other." Shevechenko's training camp took her from Texas to Las Vegas, up to Maine to get a feel of what the climate would be like in Canada, and then back to Vegas to watch sister Antonina take a unanimous decision over Ji Yeon Kim last weekend. "When you are acting by yourself you have the control of situation and you can manage it and know everything what will happen is in your arms," she said. "When my sister fights, I have all this time to get nervous and watch from the outside, it's definitely more nervous feelings that I have." "I will do everything to finish the fight earlier," she added. "I will use everything - my technique, my speed, my power, my heart - to finish, and the main key to be successful is to be myself." The title fight was originally scheduled for UFC 226 in Las Vegas, but Holloway was pulled from the card after suffering "concussion-like symptoms". Holloway told BBC Sport he has been impressed by his opponent's fighting style and described the UFC 231 main event as a "fighter's fight". "People always try to do fantasy match-ups, like 'I wish that guy would fight this guy', well it's here, two young kids in their prime," he said. The Londoner will be looking to end a two-fight losing streak when he takes on Santos, who won a 'Fight of the Night' bonus in his last outing. Meanwhile, Gunnar Nelson - who has a professional record of 16-3-1 (7-3 in the UFC) - is back in action after almost 18 months out with injury to take on Alex 'Cowboy' Oliveira.